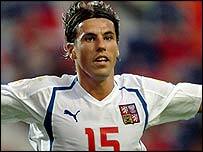 Striker Milan Baros fired the Czech Republic into the semi-finals of Euro 2004 with two superb goals in the second half against Denmark. Jan Koller had given the Czechs the lead after the break when he headed in Karel Poborsky's corner. But it was Baros who stole the show, first lifting the ball over Denmark's Thomas Sorensen after latching on to Poborsky's clever through-ball. Baros then met Pavel Nedved's pass to smash home his second inside the area. The Czech Republic will face Euro 2004's surprise package Greece in Thursday's semi-final, with Baros now the competition's leading scorer on five goals. The Czech Republic, who went into the quarter-final as the tournament's standout team to date, started brightly. Target man Koller and his accomplice Baros kept the Denmark defence busy early on, while captain Nedved pulled the strings in midfield. All three tested Denmark keeper Sorensen and Thomas Galasek tried his luck from range for the Czechs. Denmark gradually imposed themselves on the game, their passing and movement accurate but without really posing much of a threat. Given the importance of the encounter, caution was the dominant theme of a sterile first half. But all that changed after the interval. The game desperately needed a goal and it came four minutes into the second half when Koller rose unmarked in the Denmark area to head in Poborsky's corner. Nedved burst forward to win the corner, but questions will be asked of Denmark defender Martin Laursen, who inexplicably failed to pick up the giant striker. Denmark came back at the Czechs immediately, and Marek Jankulovski did well to keep Jon Dahl Tomasson at bay with a timely challenge. The Czech Republic then stepped up a gear of their own and the game was effectively over as contest after two excellent goals in two minutes by Baros. Sensing that the game had swung in their favour, Poborsky stormed down the right and picked out Baros with an exquisite through-ball. The Czech forward kept his cool when going in on goal and finished with a deft chip over Sorensen. If his first goal was all about finesse, Baros' second was a product of his powerful left foot as he smashed Nedved's defence-splitting pass past a shellshocked Sorensen. That was Baros' fifth goal of the tournament, making him Euro 2004's leading scorer. Czech Republic coach Karel Bruckner opted to save his star striker for the semi-final and replaced him with the exciting Marek Heinz. Denmark offered little in response after seeing their hopes of a meeting with Greece dashed within the space of minutes. The Czechs finished strongly and will go into Thursday's game brimming with confidence after another accomplished performance. Czech Republic: Cech, Jiranek (Grygera 39), Ujfalusi, Bolf (Rozehnal 64), Jankulovski, Galasek, Poborsky, Rosicky, Nedved, Koller, Baros (Heinz 70). Subs Not Used: Blazek, Kinsky, Mares, Smicer, Lokvenc, Vachousek, Hubschman, Tyce, Plasil. Denmark: Sorensen, Helveg, Laursen, Henriksen, Bogelund, Poulsen, Claus Jensen (Madsen 71), Gravesen, Gronkjaer (Rommedahl 78), Tomasson, Jorgensen (Lovenkrands 85). Subs Not Used: Skov-Jensen, Andersen, Niclas Jensen, Sand, Kahlenberg, Kroldrup, Daniel Jensen, Priske, Perez. Milan Baros has scored in all four matches at Euro 2004, one match short of Michel Platini's record for scoring in most consecutive European Championship finals matches. Baros's two goals against Denmark have brought his total in the tournament to five making him the leading scorer. Karel Poborsky's two assists mean he now has a record six European Championship finals assists. The Czech Republic are the only team left at Euro 2004 with a 100 percent record. This was Denmark's first defeat in a competitive match since April 2, 2003 when they were beaten 2-0 by Bosnia in a Euro 2004 qualifier.